Debra Tice, Austin Tice’s mother, delivers remarks at the banner’s unveiling on Nov. 2. 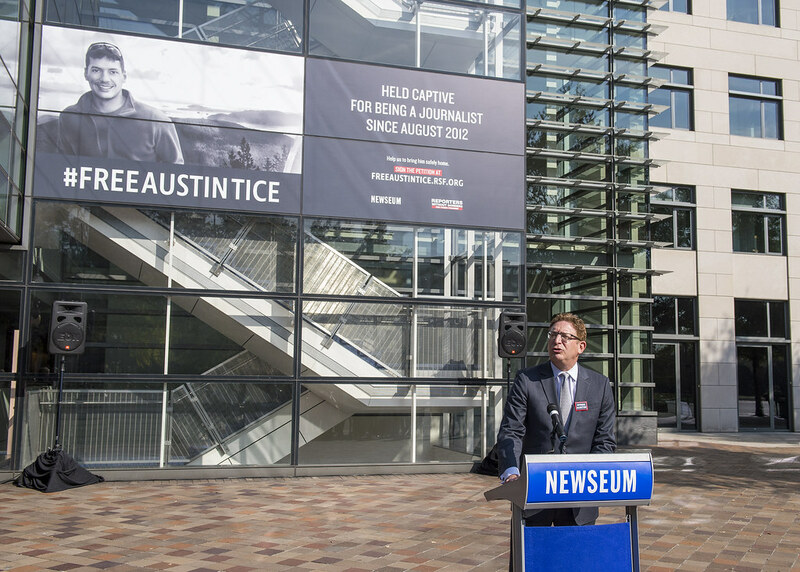 On Nov. 2, the International Day to End Impunity for Crimes Against Journalists, the Newseum and Reporters Without Borders (RSF) unveiled a banner on the Newseum’s facade asking for the safe return of journalist Austin Tice. 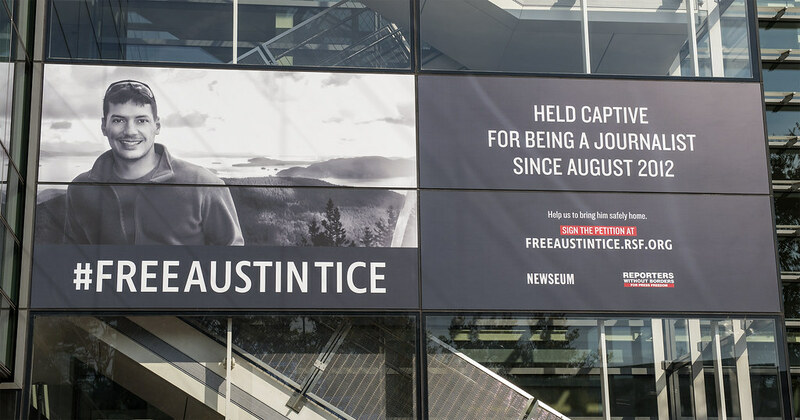 The banner, which faces Pennsylvania Avenue, features a photo of Tice and the message, “Held captive for being a journalist since August 2012.” Tice is the only American journalist held captive in Syria, according to RSF and other sources. “This banner will stay in front of the Newseum until Austin Tice is released. 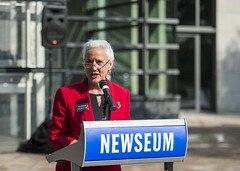 It will be here if he is not released before Jan. 20, when the next president walks by,” said Jeffrey Herbst, president and CEO of the Newseum. Delphine Halgand, U.S. director of RSF, and Douglas Jehl, Washington Post foreign editor, also delivered remarks on behalf of their organizations emphasizing their commitment to Tice’s safe return. Austin Tice went to Syria in 2012 as a freelance journalist to report on the conflict there. His work has been published by McClatchy Co., The Washington Post, The Associated Press, AFP, CBS, NPR and BBC. His reporting earned the 2012 George Polk Award for War Reporting, the 2012 McClatchy President’s Award and the 2015 National Press Club John Aubuchon Press Freedom Award. On Aug. 14, 2012, three days after his 31st birthday, Austin Tice was taken captive as he was preparing to travel from Daraya, near Damascus, Syria, to Beirut, Lebanon. He is alive and he is not being held by ISIS, according to diverse credible sources. The banner was unveiled on Nov. 2 outside the Newseum's exterior on Pennsylvania Avenue. 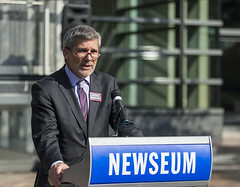 Jeffrey Herbst, President and CEO of the Newseum, remarked on the Newseum's commitment to Tice's safe return. 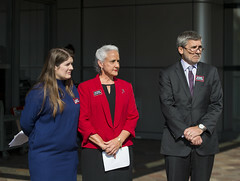 Douglas Jehl, Washington Post Foreign Editor, spoke about his organization's commitment to Tice's return. 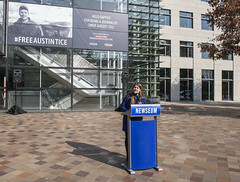 Delphine Halgand, RSF US Director, remarks on the #FreeAustinTice campaign. 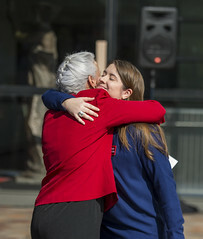 Halgand and Debra Tice embrace. 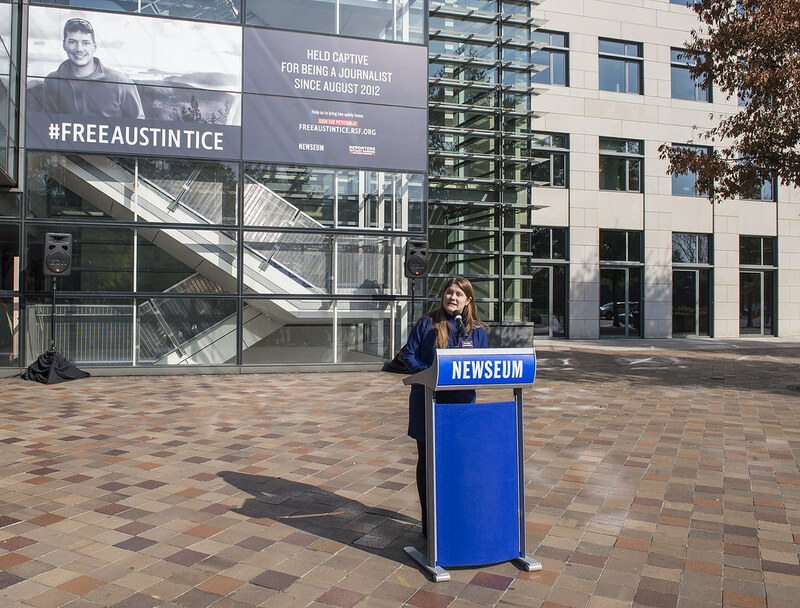 “Austin has been held captive in Syria for 1,542 days,” said Debra Tice, his mother. This entry was posted in News by Laura Chuckray. Bookmark the permalink.